Bognor RFC all but sealed a top three finish in Hampshire Premier after dominating rivals Fordingbridge in front of a partisan crowd. The Purple and Greens started brightly against the visitors and never let up in securing a bonus point 39-13 victory. The five points puts an 11 point gap between Bognor in third and fourth-place Fordingbridge with just seven matches of the season remaining. Next up for Billy Toone’s side is a trip to mid-table New Milton & District tomorrow where they will look to make it four wins in a row. With a 12 point gap still separating Bognor from undefeated league leaders Basingstoke all focus will be on trying to chase down second-place Sandown & Shanklin, who are just a bonus point win ahead in the standings. 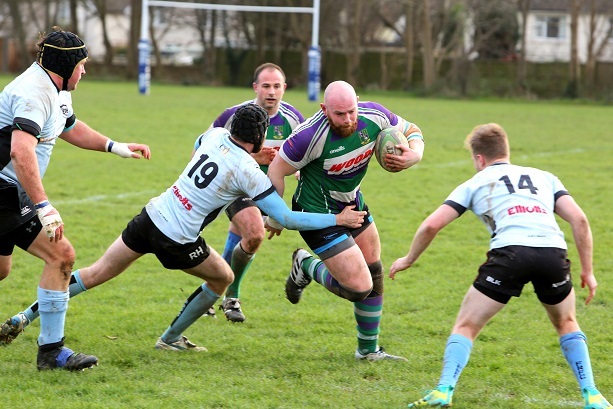 The Purple and Greens will want to continue their tradition of fast starts, which they showed again against Fordingbridge at Hampshire Avenue last weekend. Fly-half Dave Sweeney zipped the ball out wide to his pace men Dan Robinson and Sam Newcombe, the outside centre dotting down within 30 seconds of the whistle blowing. 5-0. Bridge notched a penalty shortly after but skipper Josh Burgess added to Bognor’s lead shortly after. But the visitors did not give up and scored a converted try and penalty before the break to take a 10-13 lead. Into the second period, Bognor started to take control and prop Chris Webb scrambled over to restore their lead. Further tries from Newcombe and speedster Josh Burnett sealed the victory and bonus point for the Purple and Greens before full back Dan Robinson wrapped up the scoring. –Budding teen rugby players wanting to take the step up into the men’s game are invited to attend the Bognor RFC Colts Academy training day.